As a former educator, I am most grateful to Random House Children’s Books and Pat Scales for the excellent, detailed guide below. The Great Depression has disrupted the safe and secure life that Margo Bandini has grown to enjoy in the small town of Johnstown, Pennsylvania, where she lives with her parents and younger brother. In school, Margo has studied Black Thursday and the Domino Effect. She has watched hobos come to her house for food, witnessed Sheriff Sale signs on the houses of her neighbors on Maple Avenue, and has taken notice when Papa comes home with produce as payment for repairing shoes. But, the dark days of the Great Depression take on a new meaning when she comes home from school and sees a Sheriff Sale sign on her house. Desperate to save her family from economic despair, Margo writes to Eleanor Roosevelt for help. When she receives an unexpected reply, Margo scores a victory for her family and learns the true meaning of brotherhood. 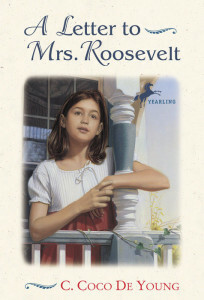 A Letter to Mrs. Roosevelt is a story about brotherhood, courage, fear, pride, and family relationships. The vivid portrayal of the time period and the heart-warming reality of a family’s struggle to survive economic devastation will help students understand this dark period in America’s history. The powerful themes, the courage of the 11-year-old main character, and the strong sense of story make the novel ideal for a novel study or read-aloud. This guide offers activities for using the novel to connect language arts, social studies, health, careers, music, and creative drama. Tell students that Eleanor Roosevelt was a champion for human rights. Read aloud Article I from the Universal Declaration of Human Rights: “All human beings are born free and equal in dignity and rights. They are endowed with reason and conscience and should act towards one another in a spirit of brotherhood.” Discuss with the class the meaning of different ways of showing brotherhood. Then ask students to find an article in the local newspaper about someone who has demonstrated brotherhood, summarize the article in one sentence, and display their sentences on a bulletin board. Discuss how the Great Depression affected family life. Compare Rosa’s family to the Bandini family. How does each family deal with the economic strain of the Depression? What could Rosa’s father learn from Mr. Bandini? Describe how each member of the Bandini family pitches in to help when things get tough. How do you know that Mama and Papa Bandini have respect for one another? What does the phrase “swallow your pride” mean? How do the people in the novel have to “swallow their pride?” Who has the most difficult time “swallowing pride?” What does the phrase “false sense of pride” mean? Margo says that she is very proud of her Mama and Papa. How do Mr. and Mrs. Bandini instill pride in Margo and Charlie? Miss Dobson, Margo’s fifth-grade teacher, tells the class that the Great Depression began on October 24, 1929, a day called Black Thursday. Ask students to research the cause and effect of Black Thursday. Then ask them to write a front-page article that might have appeared in the Johnstown, Pennsylvania, newspaper on October 24, 1929. Eleanor Roosevelt is credited with changing the role of the First Lady. Ask students to find out the many activities that Eleanor Roosevelt dedicated her time to during her years as First Lady. Then have them research the activities and accomplishments of First Ladies since Eleanor Roosevelt. Which other First Ladies do you think Mrs. Roosevelt would most admire? Which First Lady would most admire Eleanor Roosevelt? Ask students to support their answers with documented information. Charlie has osteomyelitis and is hospitalized for four months. Franklin D. Roosevelt is struck with polio and confined to a wheelchair. Find out the cause of each disease and the treatments. Find out when the cure for polio was discovered. Have students locate information about the hospital in Warm Springs, Georgia, where Franklin Roosevelt went for treatment. Miss Dobson tells Margo that she is a good writer and should consider a career in journalism. Have students find different job opportunities in journalism and where in their state or region they can study journalism. Have the class watch the movie Annie and compare the setting of the movie to the setting of A Letter to Mrs. Roosevelt. Who is Margo Bandini’s Daddy Warbucks? Divide the class into small groups. Ask each group to prepare a scene where Margo Bandini meets Annie after the Roosevelts have touched their lives. The vocabulary in the novel isn’t difficult, but students should record words that are unfamiliar and try to define them using the context of the story. Such words may include superstitious (p. 4), ledger (p. 7), mortgage (p. 18), inauguration (p. 27), and collateral (p. 54). Teaching ideas prepared by Pat Scales, Director of Library Media Services, the South Carolina Governor’s School for the Arts and Humanities, Greenville, South Carolina. Was penicillin available in 1929? Radio was the main source of news. When was the TV invented? What were Italian immigrants seeking when they came to the United States? What jobs were available for immigrants in Johnstown? Compare and contrast between 1933 and now, the time it took to travel from Italy to the United States. Compare and contrast prices between 1933 and now, on items such as clothing, housing, a loaf of bread, a gallon of milk, one pound of peanut butter kisses, and a trip to the movies. What would you take if you were Margo’s age and could pack only one suitcase? How do you feel when you see the Statue of Liberty?